NBC 7 Meteorologist Jodi Kodesh describes this as "a pretty serious Santa Ana event"
Strong winds and low humidity forecasted for this week means San Diego County is at an increased risk of wildfires. "It is going to be a pretty serious Santa Ana event," said NBC 7 Meteorologist Jodi Kodesh. "The biggest that we've had since May." 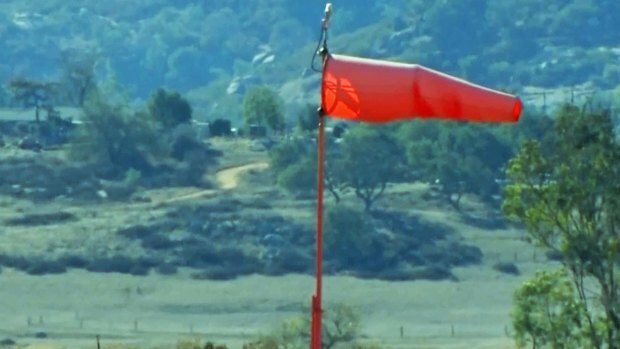 The National Weather Service (NWS) has issued a red flag warning for the mountains and inland valleys from 4 a.m. Monday to 6 p.m. Wednesday. A high wind warning was also in effect with the strongest winds expected Tuesday. NBC 7's Matt Rascon reports from Ramona on the first day of a three-day red flag warning from the National Weather Service. "We're looking at a very serious Tuesday," Kodesh said. Cal Fire spokesperson Capt. Kendal Bortisser said the agency is fully staffed with 26 engines covered at all 18 stations. There is also aircraft available to fly if needed. Humidity levels were in the 20s and 30s, considered less than half the amount of moisture normally in the air around the county at this time of the year, she added. Because of the potentially dangerous conditions, San Diego County officials have issued a fire ban for the following parks: William Heise, Volcan Mtn., Santa Ysabel, Mt Gower, Simon, Barnett Ranch, Dos Picos, Collier, Louis Stelzer, El Monte, Lindo Lake, Flinn Springs, Jess Martin, Lake Morena, Potrero, Vallecito, Agua Caliente, Pine Valley, Santa Margarita, Live Oak, San Dieguito, Guajome Regional, Otay Lakes and Sweetwater Regional. The ban means campfires and open flames are not allowed within the park. However, visitors can still use propane barbecues. In Malibu, strong winds pushed six kayakers about a mile out to sea and had to be rescued Sunday. A group of squid fishing boats came to their rescue. No one was injured. Sunday afternoon, crews battled a small brush fire at the Thousand Trails Pio Pico campground in Jamul. Cal Fire first reported the wildfire around 1:20 p.m. Firefighters stopped the spread of the fire about 20 minutes later, according to Cal Fire. The blaze burned about one acre of land. No structures were threatened by the fire, and there is no word what sparked it. Winds pushed a house fire on Deluz Road in Fallbrook into surrounding brush Sunday night. No one was seriously injured. A new online tool provided by the U.S. Forest Service, SDG&E and UCLA suggests the risk of a wildfire from this Santa Ana wind event will be marginal in San Diego on Monday and Wednesday. That threat grows to moderate on Tuesday meaning upon ignition, fires will grow rapidly and will be difficult to control. The Santa Ana Wildfire Threat Index, a classification system that analyzes the fire threat potential of the powerful Santa Ana winds, was rolled out in September to help homeowners and fire officials prepare. San Diego County officials urge residents to download the free emergency smart phone application SDEmergency and follow three key steps. GET SET: Have an emergency plan. Pack your car when Santa Anas arrive. GO: When told to leave, leave. It’s a good reminder this holiday week to be extra safe outdoors, Bortisser said.